HONG KONG, 24 Nov, 2010 - Advanced Card Systems Ltd. (ACS, wholly owned subsidiary of Advanced Card Systems Holdings Ltd., SEHK: 8210), Asia Pacific's number one supplier of PC-linked smart card readers, has been named one of Forbes Asia's "200 Best Under a Billion" companies in 2010. Early in September, Forbes Asia released a list of Asia Pacific's top 200 well-managed enterprises. Selection criteria being profitability, growth, modest indebtedness and future prospects, ACS was chosen by Forbes out of a universe of 12,930 public companies in Asia Pacific with actively traded shares and sales between US$5 million and US$1 billion. Of the companies included in the list, 71 are from China and Hong Kong, the most represented region, followed by 39 from India. ACS is one of 18 Asia Pacific companies classified under the Technology Hardware & Equipment industry, and one of only two from Hong Kong in this category. 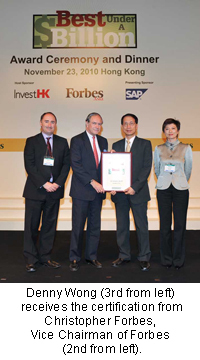 Denny Wong , Chairman and CEO of ACS represented the company and attended the award presentation ceremony on 23 Nov, 2010. "I am very happy to learn that ACS is recognized by Forbes as a well-managed company," said Denny. "We will continue our long endeavour in developing smart card and reader technologies and providing high quality products and services to our customers worldwide. I am grateful to all the staff for their dedication and their good work. I appreciate the great support from other stakeholders including our customers, our other business partners and our shareholders." Incidentally, the special recognition from Forbes Asia came just in time as ACS commemorates its 15th-year anniversary in the industry this year. For fifteen years, the company has devoted itself to the smart card industry as one of the world's frontrunners in providing smart card and reader technology products. Get the whole list of Forbes Asia's "200 Best under a Billion" at http://www.forbes.com/lists/2010/24/asia-under-billion-10_Asias-200-Best-Under-A-Billion_Company.html. Advanced Card Systems Ltd. (ACS, wholly owned subsidiary of Advanced Card Systems Holdings Ltd., SEHK: 8210), founded in 1995, is Asia Pacific's number one supplier of PC-linked smart card readers and winner of Product Quality Leadership Award for Smart Card Readers from Frost & Sullivan. One of a select group of global companies at the forefront of the smart card revolution, ACS develops a wide range of high quality smart card reading/writing devices, smart cards and related products and distributes them to over 100 countries worldwide. Visit ACS at http://www.acs.com.hk/ . Forbes Asia is the English language publication of Forbes magazine in the Asia-Pacific region. It publishes an extensive number of original articles on Asia and other regions. Forbes Asia complements the coverage of existing international editions of Forbes in the region including, Forbes China, Forbes India, Forbes Korea and Forbes Indonesia. Get the latest from Forbes Asia at http://www.forbes.com/home_asia/.